Hotel Suisse Kandy is looking at adding more luxury to the hotel and is currently upgrading their suites to meet the growing demand for them. 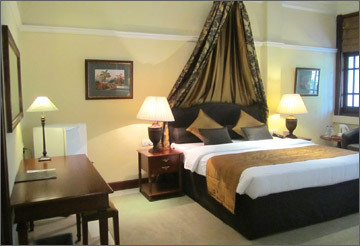 The hotel offers 55 standard rooms, 29 deluxe rooms and including suites. To meet the demands of the travellers the management is currently upgrading six to the existing Rajasinghe Suites as the foreigners prefer to stay in them. The hotel plans to build these suites depicting the culture of the ancient times with traditional architecture during the time installed in the suite. In addition the hotel will also upgrade the existing rooms with a touch of Kandyan architecture and modern luxury. 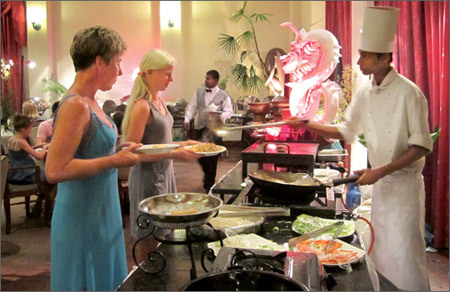 "We have already installed ancient architecture in the public area, 'rooms' restaurant to blend with the traditions in the area," said Senior Vice President, Galle Face Hotel Management Company, Chandra Mohotti. The kitchen too has been upgraded with modern utensils to cater to the growing food and beverage market. "Due to the panoramic view of the hotel it's very famous for hosting weddings and the hotel also has a steady repeater clientele." The hotel maintains high occupancy level during the season as well as the off season. "We maintain year on year occupancy of around 70 percent which includes around 3,500 foreigners each month," he said. One of the biggest attractions in Kandy is undoubtedly the Dalada Maligawa and also the botanical gardens in Peradeniya. "In addition guests also like to see craftsmen making jewellery copper and wooden carvings. "These craftsmen also get an opportunity to see their products at a premium price to the foreigners," said Rooms Division Manager Kanishka Mallikarachchi. He however said that Kandy is still considered a transit destination on the way to the cultural triangle and Nuwara Eliya. However with several new activities such as the golf course being added to Kandy people are now staying longer in Kandy. Steeped in history, Hotel Suisse has a charm of its own that enhances the atmosphere of Kandy's past glory with character than most of its modern counterparts. In the seventeenth century, it was the residence of the Chief Minister of the Royal Granary. However, in 1818, this property was acquired by the British and occupied by an Officer of the British Administration who named it "Haramby House". Years later "Haramby House" was sold to a Swiss Lady Madam Burdayron, who ran it as a guest house. This then was the beginning of the present Hotel Suisse. Another interesting factor is that during the Second World War from 1943 to 1945, Hotel Suisse was used as the Headquarters of the South East Asia Command under Lord Louise Mountbatten the Supreme Allied Commander. The first phase of the extension and renovation programme completed was the construction of a new shopping arcade, thirty five additional rooms, expansion of public areas, installation of an ultra modern lift, complete modernization of the main kitchen and installation of telephones in all rooms. The proposed second stage which concentrated on the rooms and washrooms and at the same time preserved the colonial atmosphere of the hotel, subsequently the Food and Beverage outlets too were given a facelift. It could also be recalled that Hotel Suisse catered to State Banquets hosted by President of Sri Lanka during the visits of Heads of State such as, the Crown Prince of Japan, the King and Queen of Nepal, the Queen of England and Prince Phillip, Margaret Thatcher and Denise Thatcher and Zia Ul Haq of Pakistan. 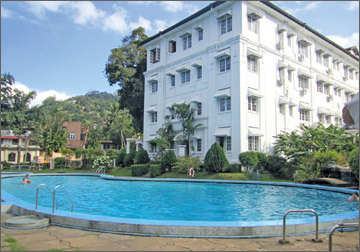 It is worthwhile mentioning that Hotel Suisse has been the selected choice of many leading Hollywood and other International Film personalities during production and shooting of acclaimed movies whilst on locations in the city of Kandy, to name a few are Steven Spielberg Director of Oscar winning "Jurassic Park", Kathleen Kennedy of "ET", John and Bo Derek of "Blue Water", Film Producer Raju Patel along with the cast and crew of "Jungle Book II" and Ms Geraldine Chaplin daughter of the famous comedian Charlie Chaplin.